The presents are wrapped and placed beneath the tree, the garland is strung, and the stars are out. We are ready to dream of sugarplums, and eagerly await the sound of Santa's sleigh bells. 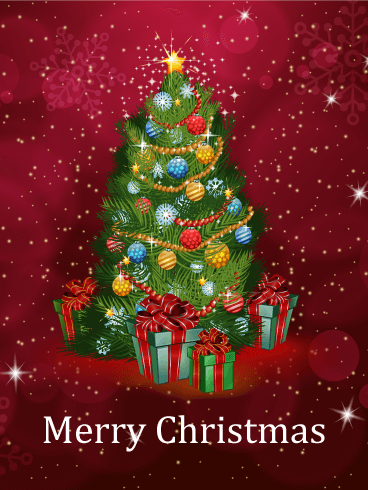 Wish someone a merry and bright Christmas with this beautiful Christmas card. 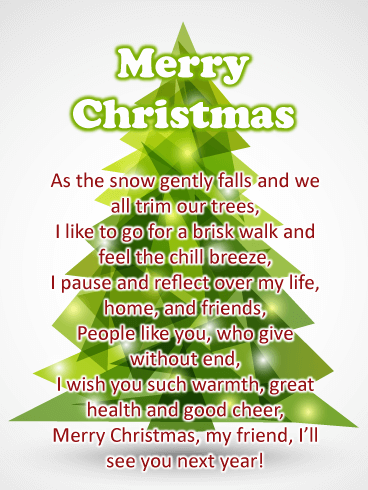 No time like the holidays for a whimsical piece of verse wishing loved ones a Merry Christmas. The color, like iced mint, over fresh snowfall, will please any aesthetic. The warm poem says it all when you can’t be there to say it yourself. So wish your friend seasons greetings by sending the Geometric Tree Merry Christmas Card, and cover all your angles. It’s the most wonderful time of the year to reach out to the people we love. 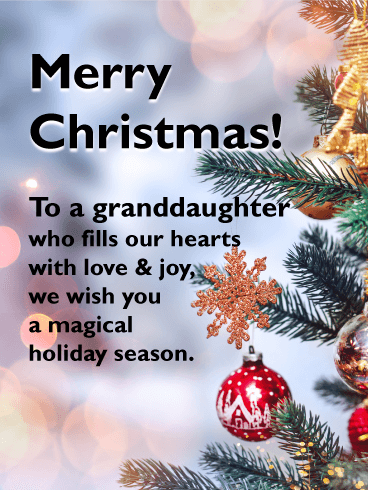 And this thoughtful Christmas card is the perfect choice for a granddaughter of any age. 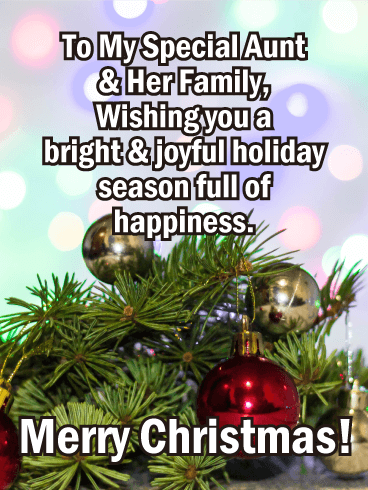 A beautifully decorated tree and warm lights in the background bring a festive touch, and the words will help wish the one who fills your heart with love and joy a magical holiday season. If you know someone who prefers only the best then this elegant Merry Christmas and Happy New Year holiday card would be perfect for them! It features lovely colors of gold, white, and green that create a stunning look. The Christmas tree showcases gold swirls and sparkling lights. It also displays a traditional Christmas bell and beautiful ornaments. 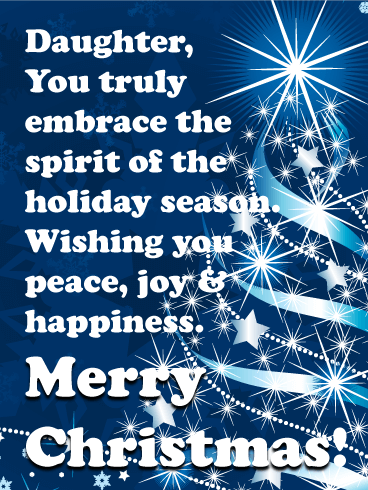 It’s an outstanding holiday card to send to anyone to wish them a Merry Christmas and Happy New year in style! 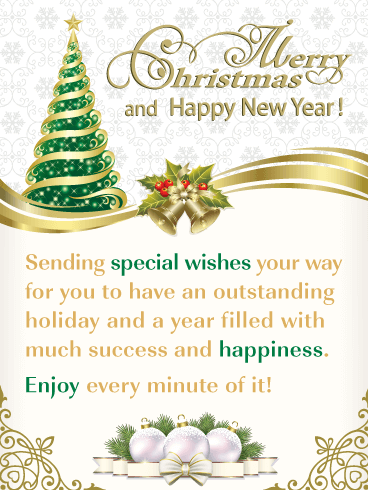 If you are looking for a Merry Christmas and Happy New Year card that will grab someone’s attention, then this is the one to send! A unique brightly lit Christmas tree is featured and it looks fantastic. 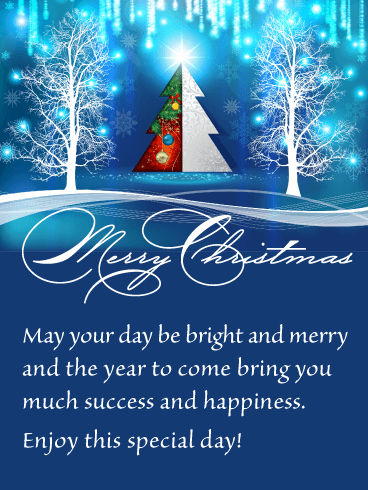 It’s set against a bright red background and displays the words Merry Christmas & Happy New Year. 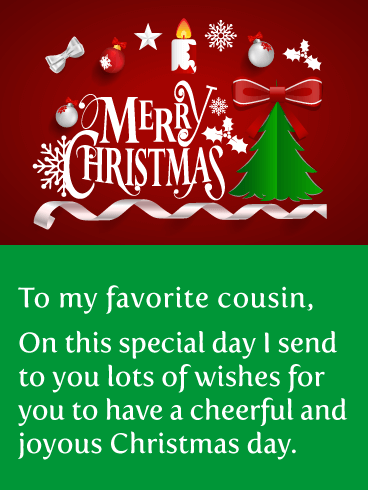 The thoughtful message will let someone know that you are wishing them a special holiday season, along with a bright and cheery Christmas day. The holidays are a special time of the year, and great for expressing how you feel about the people who are close to you. 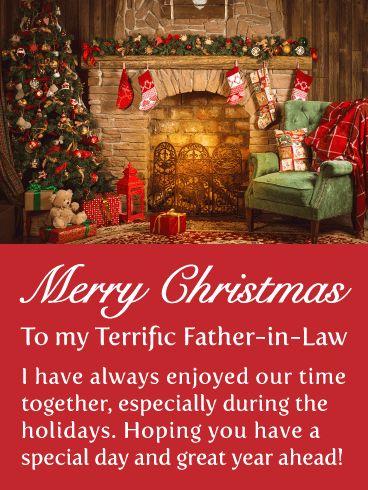 This sensational Christmas card will allow you to let your father-in-law know that you enjoy your time with him, especially during the holidays. This will certainly make him feel special! This lovely Christmas card displays a charming image of a home decorated for the Christmas season, and it looks outstanding! 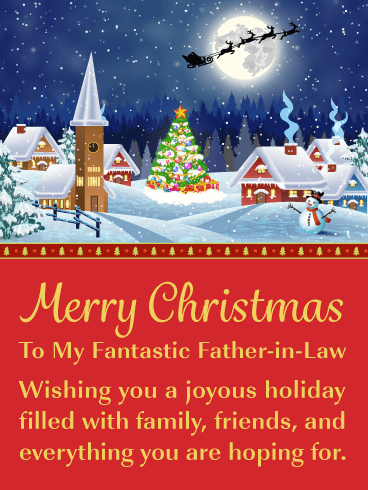 Send this incredible holiday card to your father-in-law today to wish him a terrific Christmas day! This wonderful Merry Christmas card captures the magic of the holiday season and your father-in-law is going to just love it! 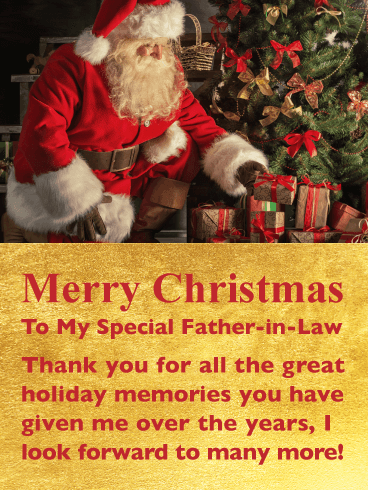 With the classic image of Santa placing Christmas presents under the tree, and the golden background, you will be sure to capture the attention of your father-in-law. The thoughtful message will let him know that you are thankful for all the great holiday memories he has given you. Send this Christmas card to your father-in-law right away so he can enjoy it on this special day. 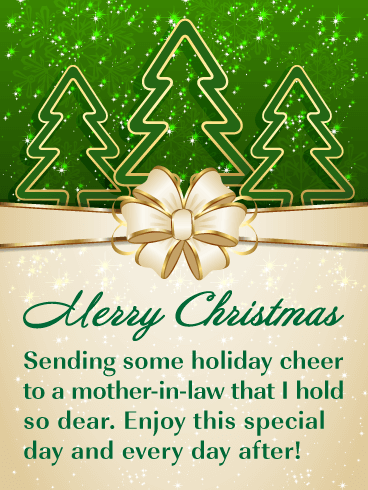 This stylish and dazzling Christmas card was designed to impress your mother-in-law, as well as brighten her day! The three creative Christmas trees are outlined in gold and have a sparkling green background. It looks fantastic! An outstanding fancy holiday bow adds an elegant look to this Christmas card, and your mother-in-law will just love it! So send some holiday cheer over to her this year by getting this extraordinary Christmas card out today! 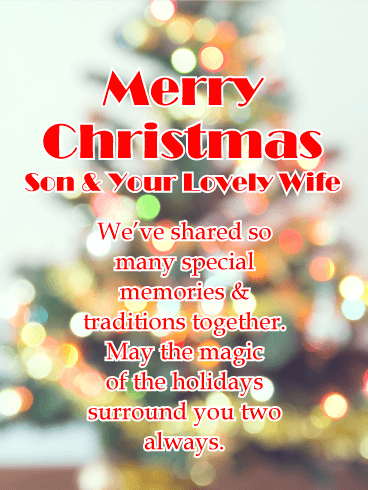 Send your son love, peace, and joy with this great Merry Christmas card! 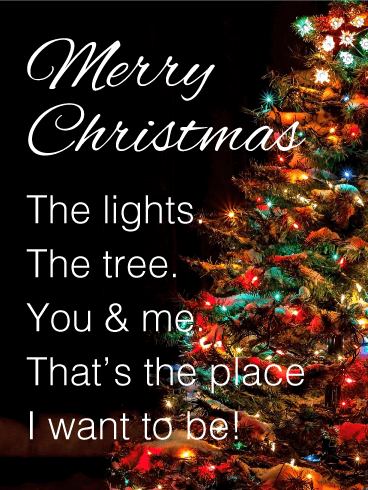 A bright Christmas tree is displayed with the words Merry Christmas artistically written below it. It looks sensational! 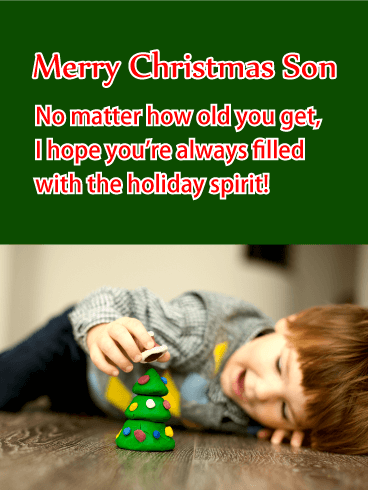 The red, green, and gold colors give this card a nice holiday feel that your son will love. The message expresses your hope that this day is all that he wished for. Get this sensational Christmas tree over to your son so he knows you are thinking of him! You may remember the excitement and wonder your son experienced as a child when he saw all that this special holiday had to offer. This Christmas card captures the essence of those moments. A toddler is seen gazing at the beautiful Christmas tree that displays bright and colorful holiday ornaments. 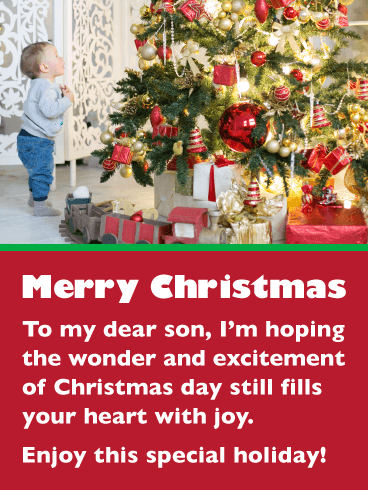 Now that your son is older, send a Christmas card that will let him know that you hope he still experiences the same joy and excitement of the season! If you are looking for a beautiful and meaningful Christmas card to send to your cousin, look no further. This exceptional greeting card will certainly impress your cousin and add some excitement to his or her day! It features a creative Christmas tree covered in snow with a wonderful blue sky set in the background. It’s a delightful winter wonderland scene! 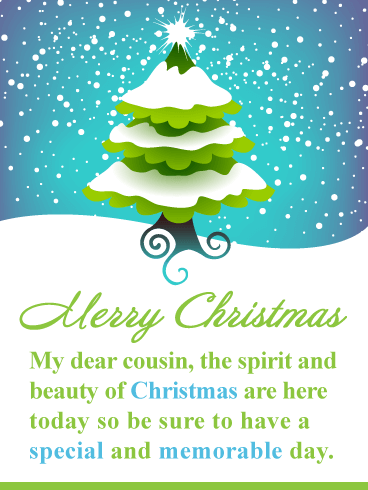 Remind your cousin that the spirit and beauty of Christmas are here today by sending this holiday card out today! Sendyourcousina very special Christmas card this year, it will add a little excitement to his or her day! 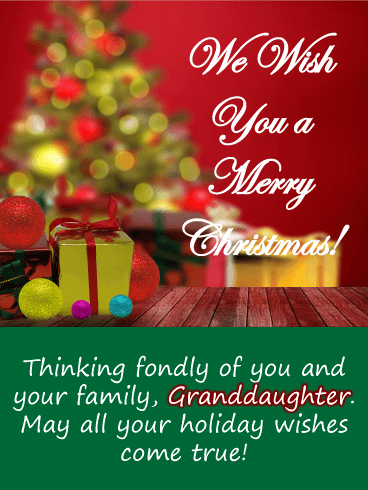 This splendid holiday card displays many fabulous Christmas icons such as ornaments, a Christmas tree, a holiday candle, ribbons, and snowflakes. 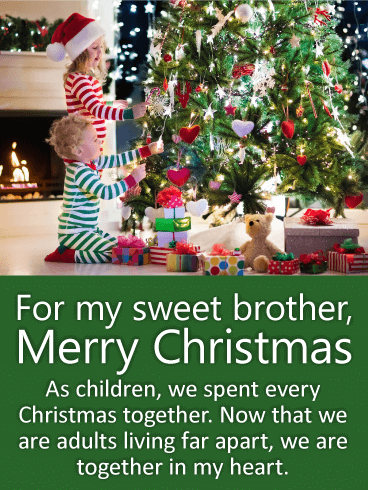 This Christmas card has every needed to wish your cousin a Merry Christmas in style. Send these special items over to your cousin today so he or she will receive them in time for Christmas day! 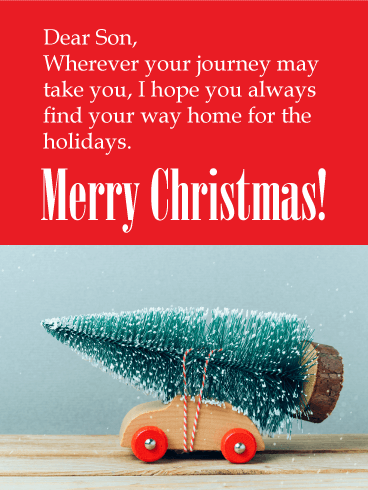 This sensational contemporary Christmas card features a simplistic and artsy feel. 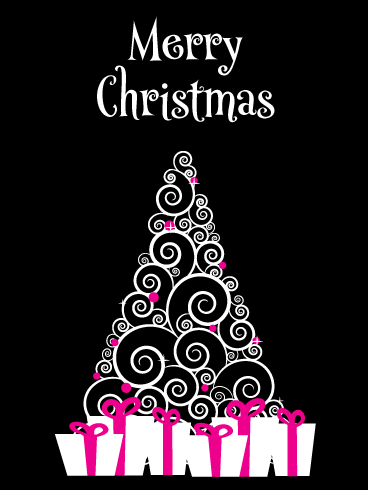 With its non-traditional Christmas colors of hot pink and black, as well as its swirling shapes that create a beautiful Christmas tree, it creates an impressive look that can spark a conversation. The Merry Christmas lettering matches well with its swirled letters. It looks absolutely amazing! 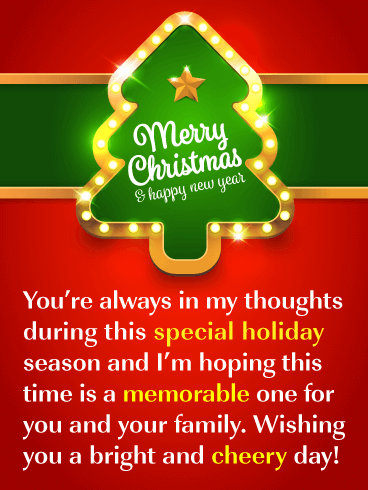 Send this modern Christmas card out today to catch the attention of someone on this special day! If you are looking for a wonderfully creative and dazzling contemporary Christmas card, your search is over. This shimmering holiday card is like no other, and will certainly capture the attention of anyone who receives it. It showcases an outstanding artistic Christmas tree, as well as a bright shining star. So beautiful! The fancy Merry Christmas lettering looks stunning, and the colors of blue and white look fantastic. 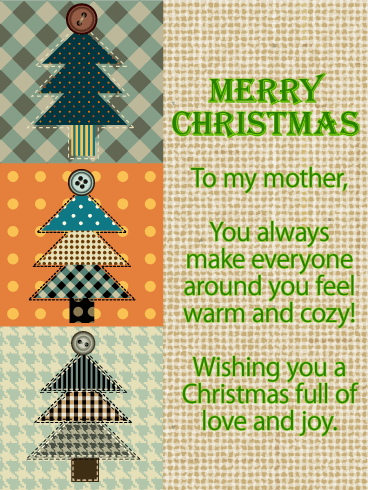 Wish someone a bright and merry day with this marvelous modern Christmas card today! The holiday season is a magical time. Spending Christmas with loved ones is the best, why not get the season started by sending festive cards to your whole family? This sweet, little card with its tiny tree and attractive gift boxes is perfect for your lovely granddaughter and her family! Let her know you’re thinking fondly of her and want all her holiday dreams to come true! Warm your mom and dad's hearts this Christmas season. Every season we continue to make memories with our friends and family. Those memories, which resonate in our hearts, are more precious than the money we spend on gifts or the lights on the tree. 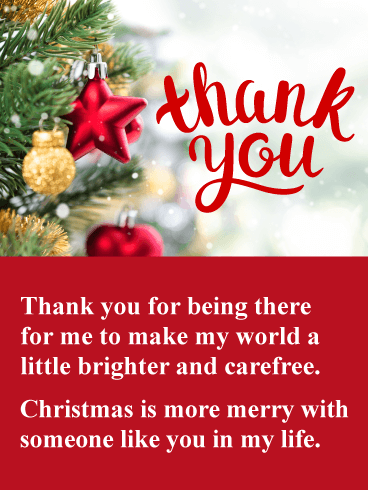 Brighten your parents' Christmas this year with this card to express your gratitude beyond the presents under the tree. 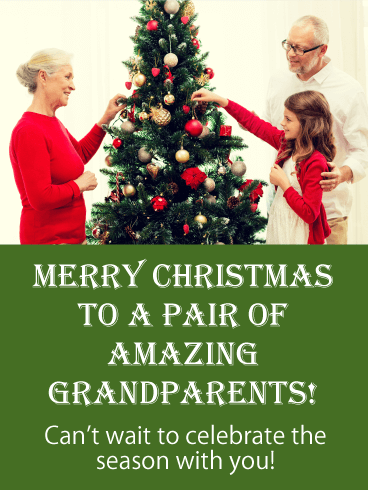 Bring good cheer to your parents this Christmas! Christmas time always brings up many wonderful memories, from baking cookies to watching snow fall gently past the window. Create tons more memories this year by filling the holiday season with happiness and joy! 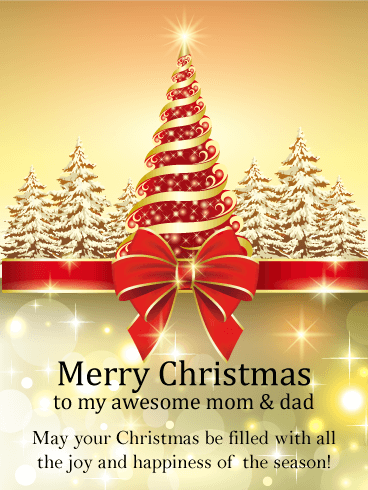 Finish the year on a magical, joyful note by sending your parents this Christmas card and fill the holiday with love. 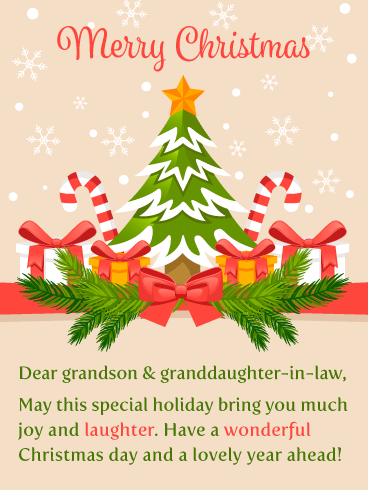 The classic charm of this Christmas card for your aunt and her family will leave them full of happiness while filling their hearts with the spirit of the season. Colorful ornaments hang from evergreen branches, setting the scene for a magical celebration. And the words are just as wonderful: a wish for them to have a bright & joyful holiday season. Christmas is a magical time of year. It's also a wonderful time to let the ones we love know how we feel. 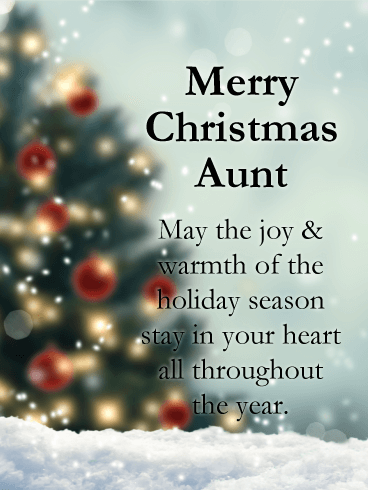 This lovely card for a special aunt captures the joy of the season with the falling snow and festively decorated tree, complete with twinkling lights. These signature sights of the holidays are sure to fill her heart with joy and remind her how much she means to you all throughout the year. The presents might be under the tree, but the real gift is gathering around it with your family! Sharing the holidays with loved ones is what makes the season so special. 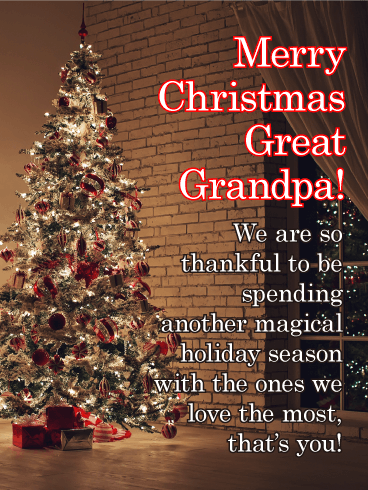 Tell your amazing grandparents you can not wait to build more memories and share another warm and wonderful Christmas with them! Send this heartwarming card of a family trimming a Christmas tree together to kick off the holiday spirit! 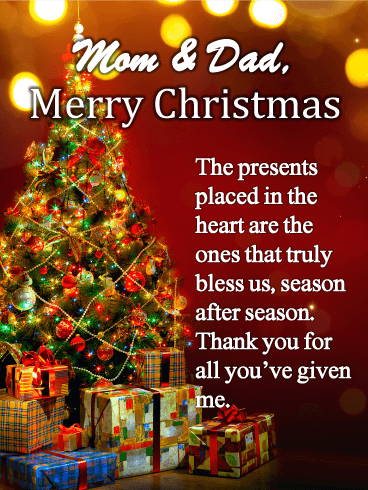 There is no better time than Christmas to practice gratitude for the wisdom and experienced guidance of a loved one. Few people encapsulate that quite like Great Grandpa. He is like the stunning tree on this card and his presence is like the gifts beneath. This holiday season give that living legend a gift he'll treasure for the rest of his life; the love and respect of his family. 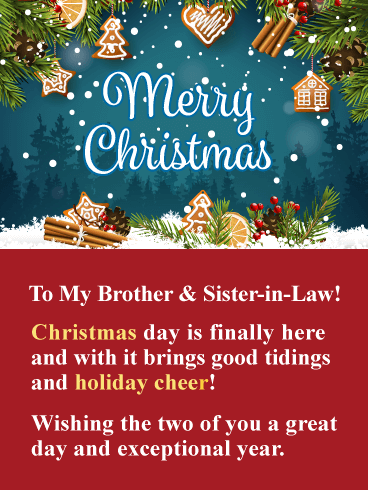 Send your brother and sister-in-law this fantastic Christmas card, it will certainly add some holiday cheer to their day! This wonderful greeting card features exceptional colors as well as traditional Christmas icons such as gingerbread cookies, Christmas tree branches, cinnamon sticks, snow, and more. They all come together to form a stunning holiday card that your brother and his wife will just love! Send this outstanding Christmas card out today to wish them both a Merry day. Sometimes we can forget to give the people in our lives the simple thank you that they may deserve. This holiday season be sure to send a thank you Christmas card over to all those people who make your life merrier. It will be a pleasant surprise and it will warm their hearts. 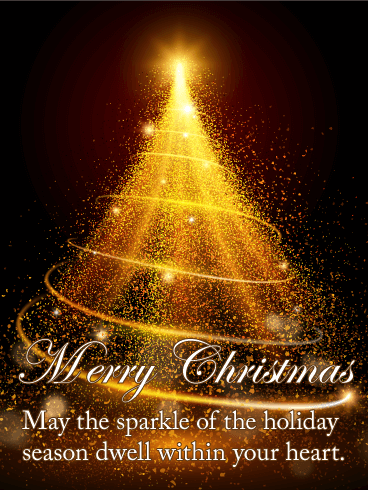 This delightful Christmas card displays red and gold shimmering holiday ornaments that are hanging on a Christmas tree. Send this eye-catching greeting card to someone special without delay! Children have a wonder & curiosity to them, especially during the holiday season. 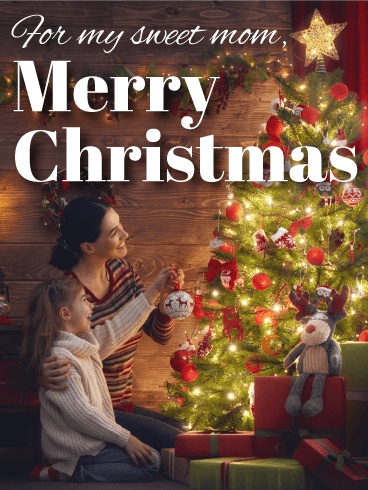 This Christmas, remind your son to always keep the holiday spirit alive in his heart with this joyful card featuring a young boy playing with his homemade clay tree and Santa hat. It's a touching sentiment, and no matter how old he is, it's one he'll hold onto because it came from you. He may be all grown up, but when the holidays come around, your son is always led back home, even if just in his heart. An adorable wooden toy car carries a Christmas tree on top, which will soon be decorated and proudly displayed. It's a reminder that no matter how far his journey may take him, he'll hold on to cherished memories while creating new ones as he celebrates the season. Christmas is a time for holding on to cherished memories and traditions while creating new ones with the people we care about. That's what makes this card such a special choice for your son and his wife. No matter how many years have passed, and even if he's celebrating with a family of his own, your hope for him is that he's always surrounded by happiness and love. Christmas is a magical time of year. It's also a wonderful time to let the ones we love know how we feel. 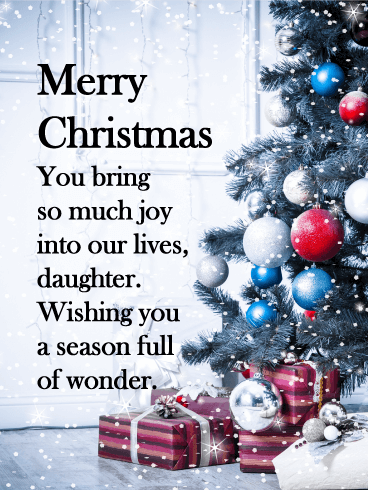 This lovely Christmas card for a special daughter captures the joy of the season with the falling snow and festively decorated tree, complete with piles of presents underneath. These signature sights of the holidays are sure to fill her heart with joy and remind her how much she means to you all throughout the year. Your daughter is your shining star. What better time to let her know than during the holiday season. 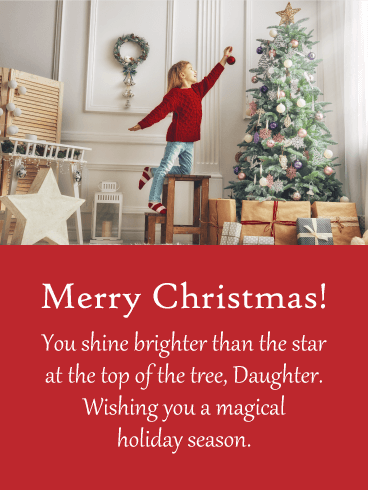 This whimsical Christmas card features a young girl reaching to add another ornament to the tree, which is already beautifully decorated. It's a chance to remind her how much she means to you and to wish her all the magic in the world, even if she's not your little girl anymore. There's something so magical about seeing a stack of gifts waiting under the tree. 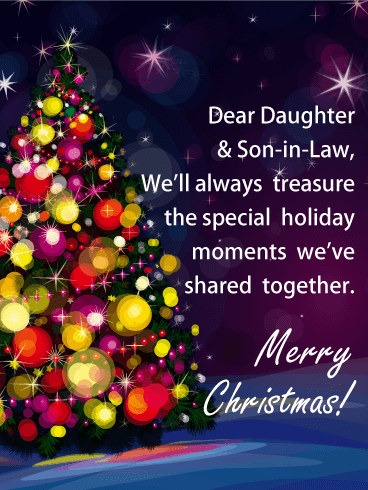 And this Christmas card for a special daughter captures that in the most wonderful way possible. It's a reminder to her that the small, captured moments mean the most, especially during the holiday season. And no matter how much she grows and how far she travels, you'll always treasure these times you've shared together. When you see beautiful shimming lights strung about the city and in homes, you know Christmas is approaching. These sparkling lights add an element of magic to the season. There is no better way to wish someone a Merry Christmas than with this brilliantly gleaming card that captures the essence of Christmas. Dazzling golden lights form a Christmas tree with a glistening star that shines above the rest. Impress someone today with a card that will light up their day! For many people, holiday traditions are part of what make Christmas so special. And for many families, moms are the ones who make sure these traditions add extra Christmas magic to the holidays. 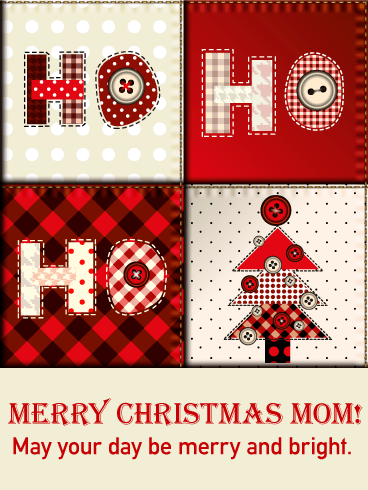 This year, add some Christmas cheer to your mom's holidays by sending her this sweet Christmas card! The heartwarming picture and sweet message will make this her favorite card of the season! No matter what anyone else says, you know that your mom is a million times better than any other mom in the world. From childhood to adulthood, your mom has taken care of you, supported you, and helped you achieve your dreams. 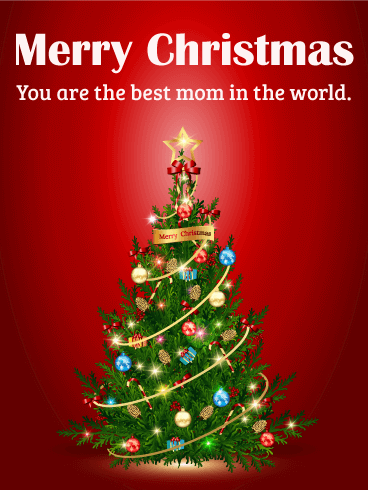 This Christmas, use this bright Christmas card to show your mom how much you appreciate the love and opportunities she gave you and to wish her a "Merry Christmas!"